Ahhh, the first camping trip of the season. Three days of glorious weather and a few new gadgets to test out! 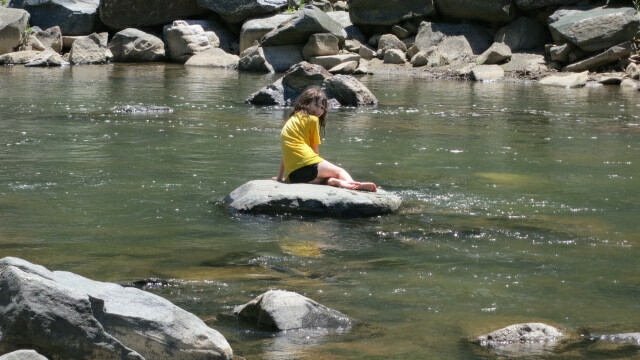 Patapsco Valley State Park has a number of camping areas that border the meandering river. We got around to booking so late this year (just like Spring Break) that we didn’t have that many options for camping within a couple hours’ drive of DC. 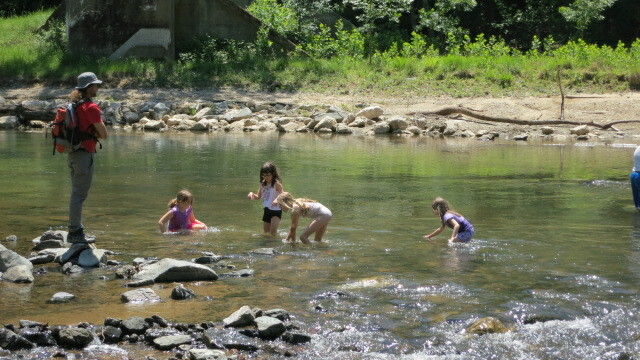 We’d been to Patapsco before and were lucky to find several sites available in the Hollofield area three weeks out. Our campsite, #446, in the outer loop was small but level. It was also nicely shaded, as were all the other sites in this loop, so there is no need to bring a canopy here as the site only receives a couple hours of unfiltered direct sunlight per day. Bikeability is not so great because of the steep ascent from the main gate area into the camping area, which is about 3/4 mile away. That’s not a terribly long way to go but the little bears would never make it up the hill and who wants to put out that kind of effort just to go for a bike ride? The campground loop has much gentler hills and is 0.37 miles around. Three quick spins around the loop and one’s National Bike Challenge points are logged for the day, if you’re obsessive about that sort of thing (ahem). Strap the bikes on the rack and head out of the park and one can drive to a number of places to find paths to bike on. We did so in prior years from the Hilton area, I think. This time, since 2 members of the family chose not to bring their bikes this wasn’t a viable option. Baby Bear did bring her bike and was having a blast buzzing around the campground loop until she blew her tire out irreparably. Unfortunately it happened the first full day here which left her looking longingly at the other little kids as they zoomed past our site. We met another couple of families who were traveling together and had kids around the same age. Naturally this meant Sister Bear spent a lot of time in their campsite mooching their apparently superior food. I swear to God I brought enough food, snacks and treats for a week’s outing but SB loves Other People’s Food (OPF) like nothing else. And, it seems, Other People’s Company. I foresee the “what am I, chopped liver?” phase in my near future. My strategy to keep us together and her out of their cooler was to do things with the Other People. 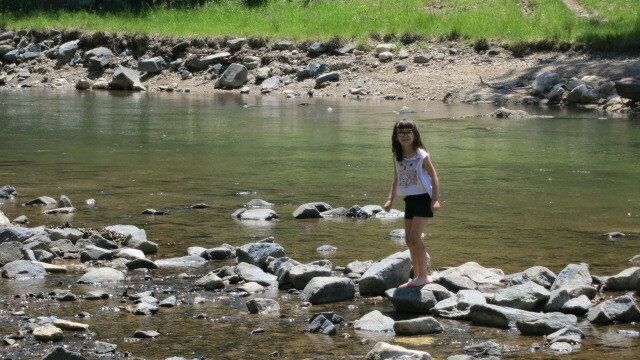 We had a lovely time down at the river near the campsite one day and then drove to a reservoir and splashed around for awhile the next day. Sister Bear successfully built her first campfire with minimal parental supervision, using the Vaseline-and-cotton-ball firestarters Baby Bear and I had assembled for the trip. To celebrate, Sister got her own Swiss Army knife. This one is a fairly basic model with a small serrated blade, toothpick, tweezers, corkscrew, bottle opener and reamer. I was about to teach her how to use the knife when she immediately sliced open the tip of her left index finger. Maybe Curious George is a better nickname for her. It bled for awhile, giving her time to rue her impulsiveness before I put her out of her misery with a butterfly bandage. Suitably humbled, she was a much better student after that. Once we went over the basic techniques she started whittling everything in site. A pocket knife is tailor made for a kid whose fingers never stop fiddling. PB and I agreed: we’re definitely getting better at this outdoor cooking thing. I’d acquired a few new gadgets and was eager to test them out. One was a folding grill that stands 11″ off the ground. Perfect for grilling food over the fire. Yes, most fire pits have built in grills but, yuck. In addition to grilling all the meat and seafood I experimented with foil packet cooking. The mixed vegetable packets turned out pretty good but the potatoes were trickier to cook through without burning. Still, everything was edible this time, which is progress. Even Sister Bear would have liked the food if she hadn’t filled her belly with OPF. 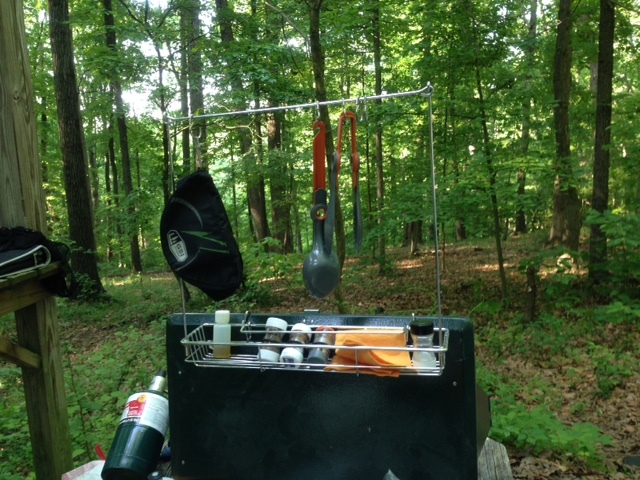 I was absolutely delighted with our newest little camping gadgets. It’s amazing how happy a small investment in gear can make me. I recently acquired a rack that has hooks for utensils and a small basket for spices and sundries and hangs off the Coleman 2-burner stove . It’s so nice to have all that little stuff handy instead of rummaging around on the table for things. Best $3 I’ve spent at REI. 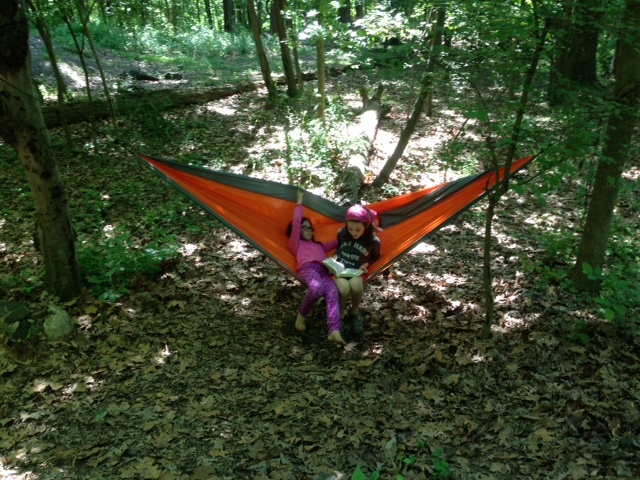 I thought the girls would finally spend a night sleeping in their hammocks on his trip. The only one chance they had to use them before this was on our December camping trip near Sedona, Arizona where it was much too cold to sleep outside. Despite mild overnight temperatures and no rain in the forecast the little Bears had two false starts before deciding they weren’t quite ready for this particular adventure. Baby Bear owned up to feeling scared while big sis claimed she wanted to stay close to her sister out of sheer love. Such love was not readily apparent most of the other hours of the day when they were at each others’ throats but one allowed this fiction to stand unchallenged. Out of sheer love. 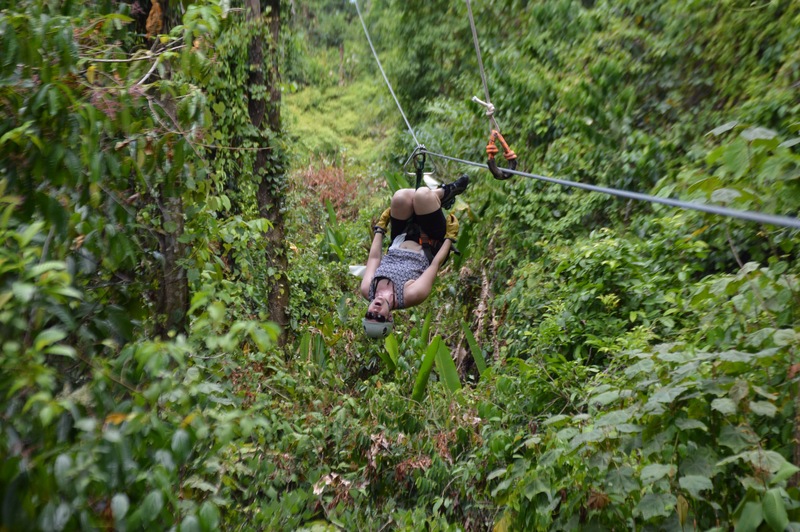 What’s a trip to Costa Rica without a zip lining tour? 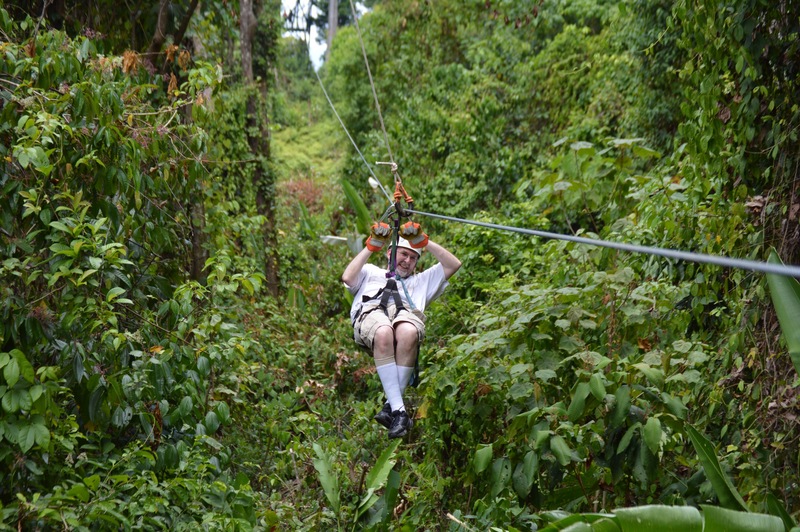 Papa Bear booked our half-day excursion with El Santuario Canopy Adventure Tours. They picked us up right at the hotel and drove us about 45 minutes to the mountainside facility. 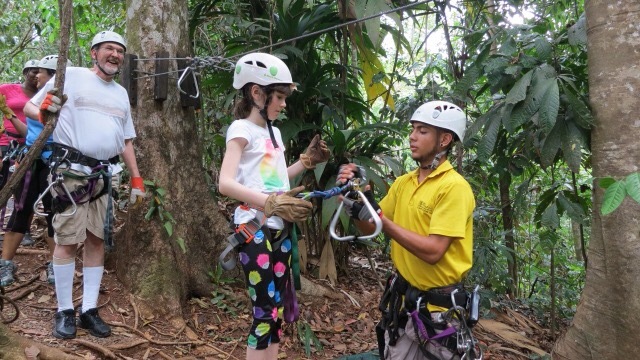 The staff outfitted everyone with harnesses and gave us some rudimentary instructions. Really, though, there’s very little to learn as the competent staff are with you every step of the way. 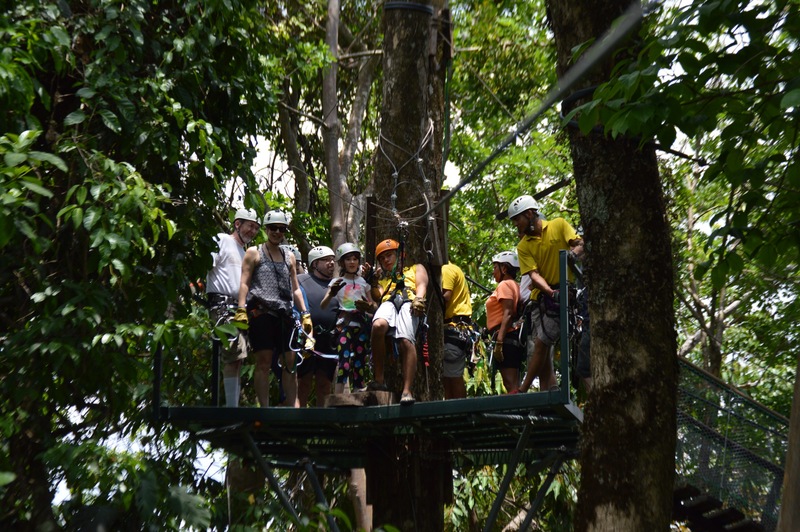 The tour consisted of a series of 11 cables interspersed with brief walks through the canopy and a few climbs to elevated platforms. 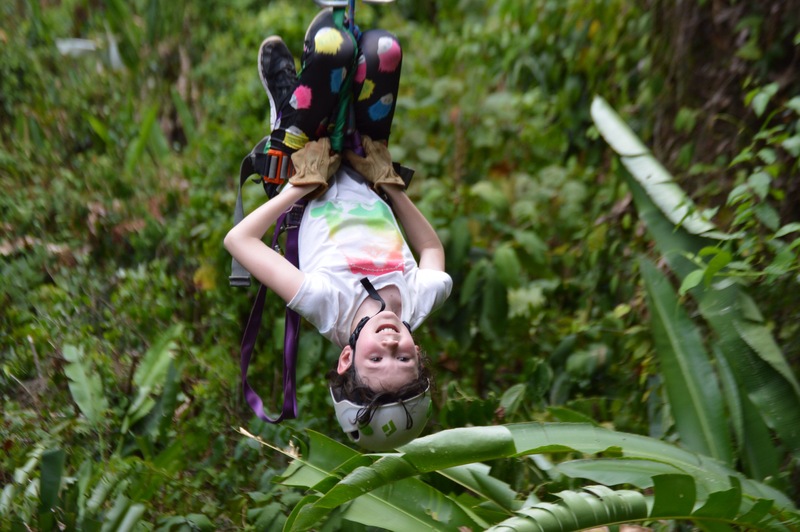 The conventional way to zip is to sit in the harness and lean back with feet out front, hanging onto a metal triangle with your hands to keep yourself from spinning around. Or you can accept the staff’s challenge and go upside down. Papa Bear knows what happens to my brain when a challenge is extended: I’m like a bull seeing a red scarf. All common sense is gone and I charge ahead. Now I trusted that the tour staff knew what they were doing and I wasn’t really in any danger but holy crap that was a freaky feeling. Freaky amazing! I guess Sister Bear inherited some of that trait from me as she, too, went down upside down. Unlike me, I’m pretty sure she didn’t scream the entire way down. There a couple of very long lines on the course, the longest being more than 4300 feet. When the little bears didn’t have enough mass to make it all the way down they were either connected to a guide for the ride or rescued when they stopped 20 feet from the end. After the last rope, we were still at least 100 feet off the ground so we “rappelled” down, which was its own special pleasure. At the conclusion of the tour we were served a hearty lunch of roast chicken, rice and beans, and salad. For an additional fee we purchased the photo package taken by the staff, which were far superior to our own lame efforts. Some of these photos are theirs.) It was all we’d hoped it would be. And more. The more being Baby Bear losing her cookies just as the van dropped us back at the hotel. Fortunately for the van occupants, she made it out of the van before doing so. Not so lucky were the hotel staff who had to clean it off their steps. The heat and humidity got to us all. I ended up with a rather nasty case of heat exhaustion which extended well into the next day. Oh well, time for another day of relaxing. With our body clocks still two hours ahead of Costa Rica time, we awoke way too early for the hotel restaurant to be open. We hung around the room for a bit then went off in search of breakfast. We found it at The Marlin, a 10-minute walk down the beach. This open-air restaurant would become our go-to breakfast place because they open at 7 am and they serve good food. 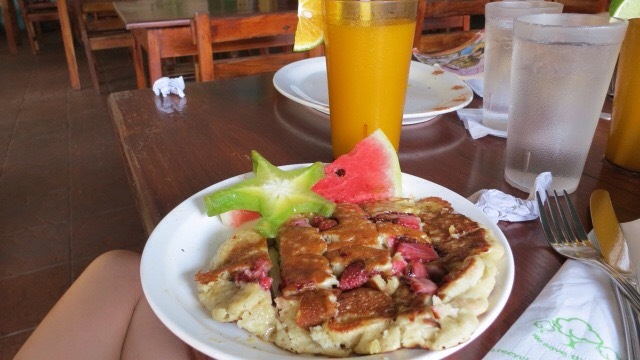 At last, real Tico food. 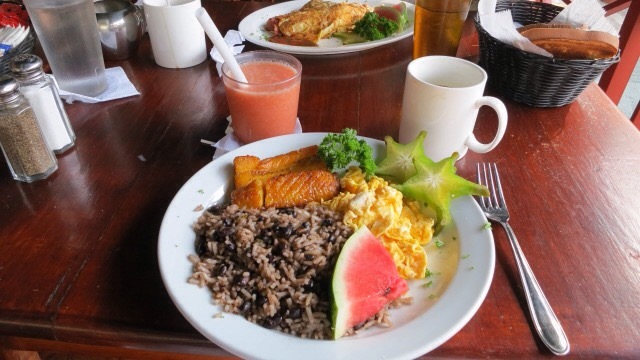 I was thrilled with el tipico, the typical Tico breakfast of eggs, plantains, rice and beans (gallo pinto). The girls went for the pancakes and Papa Bear had, yes, The American. Baby Bear was in seventh heaven over the ginormous glasses of fresh fruit juice on offer. She indulged in this relatively inexpensive luxury at every meal today, which turned out to be a wee bit too much, and resulted in a mild case of the hives that got her banned from fruit juice for a couple of days. 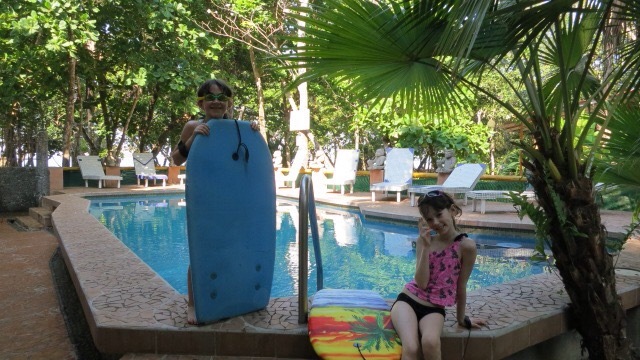 For the rest of the day we alternated between the pool and the beach with the girls digging the boogie boards we borrowed from front desk. A nice relaxing day of settling in and recovering from the journey here. Today was our travel day. We took a direct flight from IAD to San Jose, Costa Rica. The airport is quite small and before we knew it we were outside. I had hoped to find an ATM to take out colones for the next day or so but all I could find was a money changer charging obscene rates. So off we went with no local currency. The plan was to take a free hotel shuttle to the airport Holiday Inn and wait there for our van to the coast. We looked in vain for any kind of signage that would indicate where the shuttles stop but to no avail. Fortunately, the locals were very friendly. Normally when a local approaches an obviously lost or confused tourist who no doubt just got off a long flight I assume it’s to perpetuate some kind of scam. Like when we were charged 5 times the normal rate for a ride from the airport in Athens. I was pleasantly surprised when several taxi touts, out of the apparent goodness of their hearts, helped us figure out where to stand to wait for the shuttle. I started to relax and thought, “Bienvenidos a Costa Rica”. The hotel the shuttle went to is part of a complex that includes a casino, Denny’s restaurant and another hotel. I tried to change money in the hotel but they wouldn’t do that for people not staying there. So I ventured into the casino and, after a couple of attempts, managed to take out some cash. The chief impediment on my first try was I had absolutely no idea what the exchange rate was. Faced with a set of very large numbers I was unsure if I was taking out the equivalent of $50 or $500. A quick check of the Internet confirmed the actual number was more like $100. We had a few hours to kill before our van arrived and there wasn’t much to do, aside from gambling, so we ate lunch in Denny’s. Yes we did. 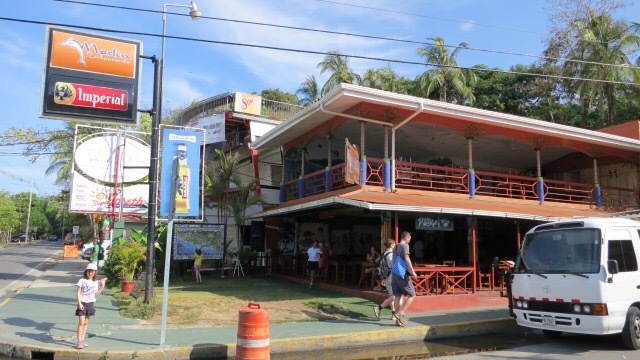 Our first meal in Costa Rica was not some local speciality, like the gallo pinto that can be found everywhere, but good old American diner food. Welcome to Costa Rica. At long last we boarded our small van, operated by Interbus, for the 3-hour trip to Manuel Antonio. Said trip would have been 30 minutes shorter had we not stopped at the tourist trap souvenir shop which also serves as a transfer point for people going to other destinations. I was adamantly against buying a bunch of souvenirs before we had even spent any time in country. On ice cream, I relented. After a long day, we arrived a the Hotel Verdemar around 7 pm pretty zonked and not at all hungry. Nothing tells you you’re near the equator more than 6 pm sunset in April. As it was quite warm, we took a quick nighttime dip in the lovely hotel pool and dipped our toes in the nearby ocean before crashing. Early March 2015. We’d been talking about going somewhere for Spring Break, a mere 5 weeks away, but had made no plans. 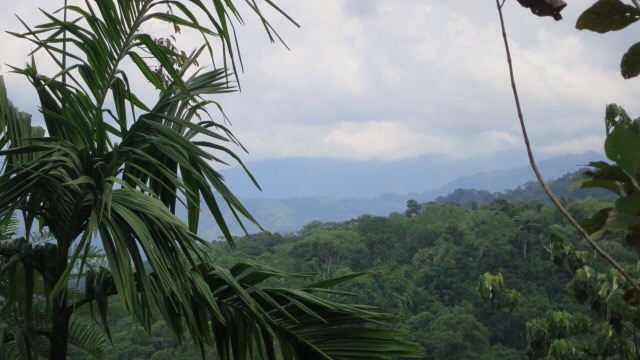 On a whim, I checked out various routes from DC to San Jose, Costa Rica. Direct flight on United? Ooh, that’s promising. Despite becoming airline-agnostic when we moved from Houston (where we were Continental-then-United captives for obvious reasons) and collecting miles across multiple airlines, I’ve always had the easiest time redeeming for decent flights on United. A quick check of the balances showed enough between my and Papa Bear’s accounts to purchase four award tickets. Business class was even available for the return flight, which was routed through Panama City on Copa Airlines, at the same points level as coach. OK, let’s do this!! So, with no plan other than knowing the dates and times of our flights, it was time to decide exactly where in Costa Rica to spend our week. 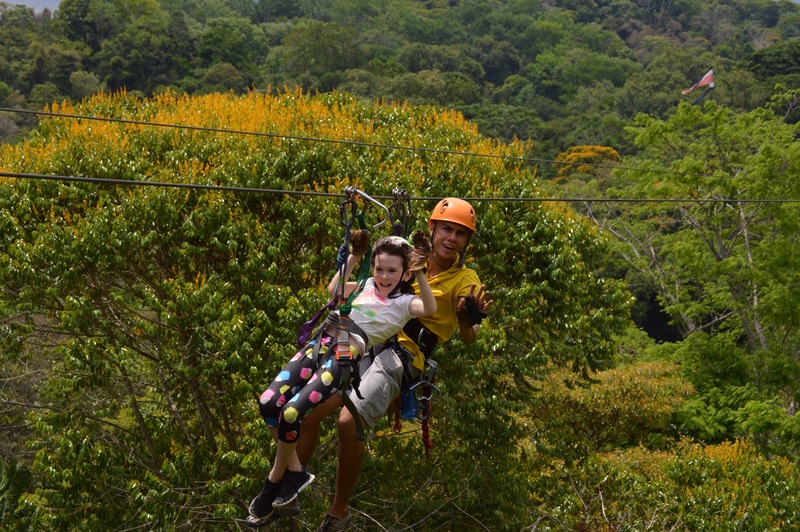 Volcanoes, beach, zip lining, surfing? So many choices, so little time in country. 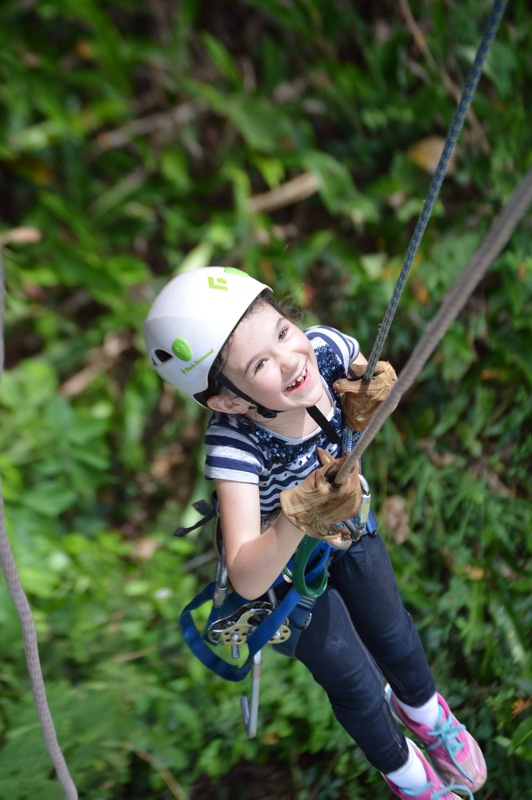 The little ones’ ages ruled out some of the more adventurous options like white-water rafting and bungee jumping but there were still plenty of cool options left. 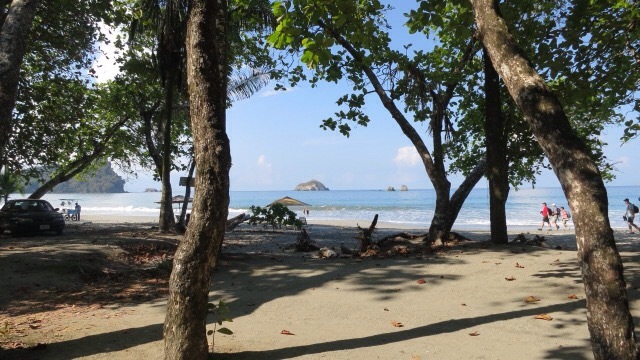 Ultimately, we decided to spend the whole week in the area of Manuel Antonio, the site of a national park and beautiful beach. 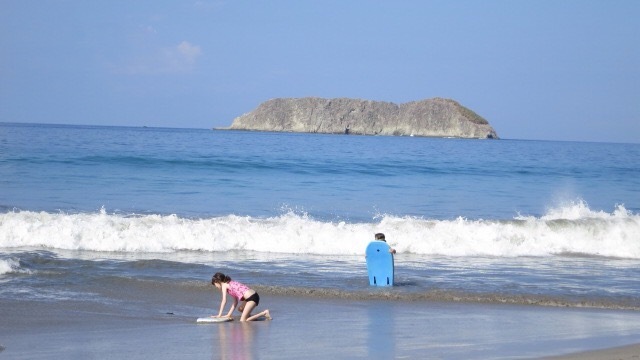 Situated on the Pacific Coast, the Manuel Antonio area provided access to several tours in addition to its own attractions. 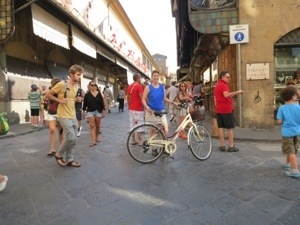 Florence in July is hot. Today hit 88 F but even before it reached the daily high standing or waking in the sun was draining and I could see the girls wilting before my eyes. Not drawn to the cool recesses of renaissance churches, despite their natural air-conditioning, the girls begged us to find a park or, even better, a pool. Both are on offer at Parco della Cascina, a fingerling of greenery in a city of stone and marble. 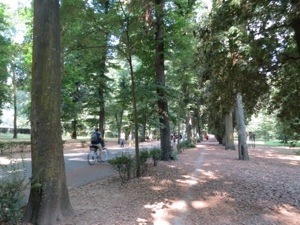 The park itself, located on the north shore of the Arno River a bit west of the city center, is well-shaded with outdoor fitness stations that the little bears enjoyed exploring. Walk almost all the way to the west end and you’ll find a public pool and rental shop offering rollerblades and bicycles. There was a long line to get into the pool when we arrived around 11 am and twenty minutes and 30-some euros later we were in. The cash we laid out at Viareggio didn’t seem so steep suddenly when we discovered the entry to the pool didn’t cover chair rental and there were no umbrellas. The bathroom facilities, on the other hand, were first-rate, with individual changing stations, toilets and showers. There was also a bag storage (for a fee, natch) which we didn’t use. 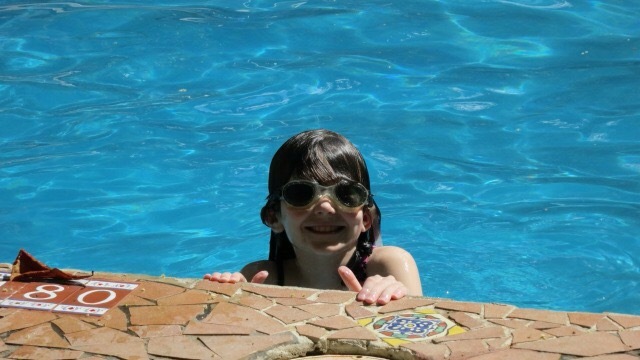 Why didn’t we choose to safeguard our belongings while we all enjoyed a family swim? Oh, right, because Papa Bear could watch them. Why could he watch our stuff? Because even after we turned back to our hotel upon reading in our guidebook about the pool so the ladies could get into their suits, AND after having my sisters buy him a suit in Viareggio because he didn’t pack one, we get to the his-and-hers changing areas and he tells me he didn’t bring his suit. 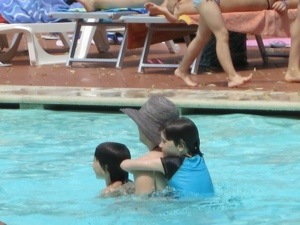 That means only one thing to me: I would be solely responsible for supervising the children in the pool. 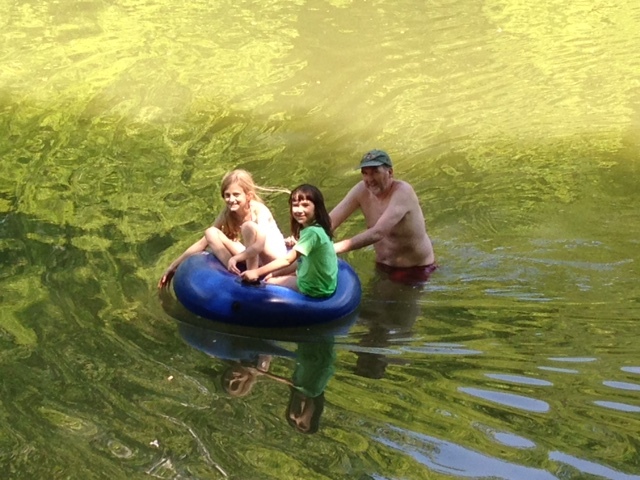 Two children, one of whom is hyperactive and the other who is not an independent swimmer. Thanks, hon! It all turned out OK in the end. The little bears are enthusiastic but not high-stamina swimmers. 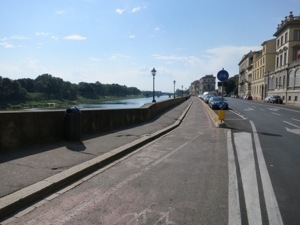 We enjoyed the pool, got a snack at the surprisingly reasonably priced snack bar and slowly meandered our way along the Arno back to our hotel room for afternoon siesta. Then as compensation I got an early evening bike ride in (for only 2.5 euros rental fee) to keep my streak going and get an hour of solo time. I headed for the river, passing by the famed Ponte Vecchio, and essentially retraced our afternoon walk through the Parco della Cascine. Wonderful seafood dinner in Florence followed by SpongeBob in Italian followed by Sister Bear tossing her cookies.